The National School of Government (NSG) officially launched the Compulsory and Mandatory Programmes, on the 18th March 2019. The introduction of the suite of programmes will require all public servants to be re-oriented in understanding the role of government and more importantly, role that every government employee needs to take up in realizing government aspirations as outlined in the National Development Plan. In the 2019 SONA, the president announced that in order to strengthen the capacity of the of the state, the NSG will introduce a suite of compulsory courses, covering areas like ethics, and anti-corruption, senior management training, supply chain management, deployment of managers to the coal face to strengthen service delivery. Through the programmes, the NSG also aims to arm new and existing public servants with skills to deal with new challenges that the government faces. 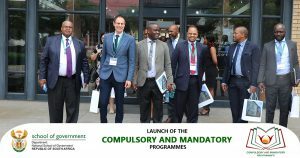 At the launch, Mr Stephen Miti, representing all provincial academies in the country pledged their support towards the roll-out and implementation of the programmes.“It is our belief that the progrmmes are driven by the need to have a capable state, and as a result we support the new venture”, he said. In addition to that, the Director-General of the Office of the Public Service Commission; Dr Dovhani Mamphiswana emphasised that if the state seeks to be the employer of choice, public servants need to lead by example and inspire confidence. Adv Richard Sizani, the Chairperson from Public Service Commission, represented Minister for Public Service and Administration, Ms Ayanda Dlodlo. In the speech he highlighted that “it is important to reflect on the political mandates given to this Ministry by the ruling African National Congress”. He further indicated that the Ministry is guided by the resolutions taken at the 54th national conference, which resolved that the transformation and modernisation of public administration should deal comprehensively with human resource development, capacity building and professionalisation of the public administration. In closing, Adv Sizani also acknowledged the role played by National Treasury in supporting the rollout of the compulsory mandatory programmes. The National Treasury provided an additional direct financial allocation to the NSG for a three-year period to implement the programmes.